TECHNOgates manufacturers automated cantilever gates for both the residential and industrial sectors. We can custom make cantilever gates for your needs, so please contact us and we will tailor a competitively priced solution for you. TECHNOgates can manufacture your cantilever gates to have manual or automatic operation –whichever you desire. Trackless cantilever gates especially for commercial properties for high security and designed for any uneven driveways. We provide highly appealing and unique designs of cantilever gates; alternatively, we can custom design a cantilever gate for you. Our design experts have the ability to translate your design requirements into a sliding gate in a way that ensures functional superiority of the gate, while ensuring that it looks beautiful and elegant. The solid structure, the sturdy frame and the smooth operating mechanism – each element of your gate is designed and manufactured with serious attention to details. Only the top-grade hardware, which is carefully handpicked by experts, is used in manufacturing your gate. 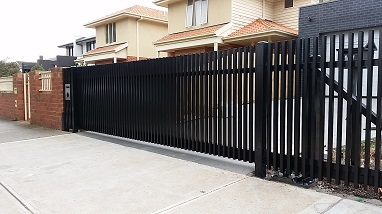 The installation is carried out with equal care and due attention is given to ensure fine execution of every procedure.All this is done so that what you receive is a cantilever gate, which looks great, is functionally superior, provides protection to your property and works without any hassle. We use our extensive training towards providing our customers with gating solutions that are durable and require minimum maintenance. With a little bit of care and attention to the maintenance requirements of your gates, you will get to elongate the life of your gates and enjoy them for extended durations. For getting cantilever gates for your residential or domestic properties, just give us a call at Technogates today.